Our lawyers handle serious injury only motorcycle accident cases in every county in Maryland. We have recovered millions of dollars for our clients in injury and wrongful death motorcycle accident cases in Maryland. Many lawyers think that if they have handled car accident cases in the past, they must be qualified to handle a motorcycle accident case. These lawyers are wrong. Motorcycle cases are a very different animal. A motorcycle accident lawyer has his back up against the wall from Day 1, even if the other driver is obviously at fault for the accident. Why? There are usually untrue negative stereotypes surrounding motorcyclists, whether they are the Harley-riding convicts, or reckless crotch-rocket-riding twenty-something or others. Those stereotypes are the reality, when beginning to present a motorcycle accident to jurors on a Maryland jury. This is true not just with the question of who is responsible for the accident, but also applies to how much the settlement is or how much the jury awards. Why is this? Insurance adjusters discriminate against motorcyclists on the value of cases and, if you are not careful, jurors will do the same. But these stereotypes continue based on the few bad apples that we see on the road. But for every misbehaving motorcyclist that we notice weaving in-and-out of traffic at a high rate of speed, there are ten law-abiding motorcyclists that we don’t pay attention to. And yet, when we hear of an accident between a motorcyclist and a car, we automatically assume the motorcyclist is at fault. Statistically, nothing could be further from the truth. Causes: Over two-thirds of fatal motorcycle accidents are caused by the drivers of other vehicles who do not see the motorcyclist in time to avoid a collision (NHTSA). Injuries: The data indicates that the medical bills for a motorcyclist in a collision average to about $2 per mile; compared to less than $.20 per mile traveled for other vehicles (NHTSA, Table 6). Injuries: The average total cost for a motorcyclists injuries is $211,000; compared to about $17,000 for all other vehicles (NHTSA, Table 6). 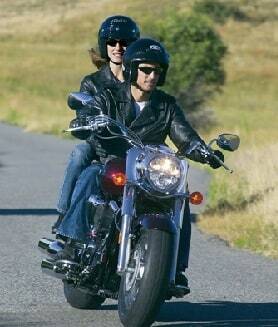 Maryland 2008 Data: 1,800 motorcycle accidents; 1,500 motorcycle injuries; 83 motorcycle deaths. Maryland: $540,000 Settlement. A motorcyclist is struck when the defendant driver runs a red light. The defendant, who had been drinking, attempts to flee the scene but crashes into a nearby ditch. The plaintiff suffers multiple fractures, internal injuries, contusions, abrasions and soft tissue injuries which require ankle surgery. Plaintiff claims that the defendant’s employer and its insurance provider ACE American Insurance Co., are liable for the defendant’s actions. The judge grants summary judgment against the at-fault driver but denies the motion against the employer. ACE argues that since there are company policies prohibiting drinking and driving, the employee was not a permissive driver. It is nice to point to a big company at trial instead of an individual because it often leads to higher awards. But it does not change the insurance policy's coverage in most cases. Although the defendants had eight attorneys to the plaintiff’s one, a $540,000 settlement is reached. Motorcyclists are not treated fairly by insurance companies. The key insurance difference is Maryland Personal Injury Protection (PIP). Basically, PIP is insurance coverage on your automobile policy that pays your medical bills or lost wages, usually between $2,500 and $10,000, if you are in an accident (even if the accident is your fault). Insurance companies must offer PIP to the drivers of most other vehicles. However, they are permitted to withhold PIP coverage from motorcyclists based on Maryland Insurance Code § 19-505. This just shows that the Maryland legislature has bought into the negative stereotypes, and they believe the motorcyclists are too high-risk for that insurance. Another distinction is for own insurance claim. If you are driving someone else’s motorcycle and suffer an accident, uninsured motorist benefits are typically available for you under your own insurance policy in the event of a crash with an uninsured or underinsured driver. But if you own a motorcycle and a car on the same policy (or, most likely, even on different policies although the law is unsettled), the policy limit on your motorcycle is going to be applied to an accident in Maryland on your motorcycle, even if you have higher uninsured benefits on another vehicle. The lesson, as always, is to have high coverage limits (including uninsured and underinsured motorist coverage) on any vehicle that you are driving. If you buy a motorcycle and ask the insurance agent to give you the cheapest possible premium, you are asking for trouble if you are in a motorcycle accident... even if it not your fault. Motorcyclists often think they are betting on themselves when they get limited coverage on their bikes. What they are really betting on is good insurance on the vehicle that did not see them and pulled out in traffic. The big thing in these bike wreck cases is to first determine who is legally responsible for the traffic accident. This usually involves visiting the scene of the incident, analyzing the location of the accident on Google Earth, getting witness statements to lock in their testimony. What we are going to do is fight with all of our powers to win your case and get you paid for the pain and suffering you have endured. The odds are stacked against the biker in these cases. We level the playing field. How? Well, lots of attorneys can talk. But we have a real history of fighting and winning traffic accident cases. If you or someone you know has been injured in a motorcycle accident, call us at 1.800.553.8082. Or, if you want some free advice online, click here. Trying to solve the crotch rocket problem: sample motion before trial to keep out evidence bike was a crotch rocket. This matters because the biker often wins these cases on the battle over what comes into evidence at trial.